New Springer platform coming soon! Even if you think you’ve never heard of Springer, you have probably used a Springer journal or ebook at some point. One of the most prolific scholarly publishers of research in science, technology and medicine, the library has access to thousands of full-text journals and tens of thousands of ebooks from Springer. On November 26, all of these books and journals will be migrated over to a new SpringerLink platform which looks and works a lot like the library search Summon, but with some additional features. 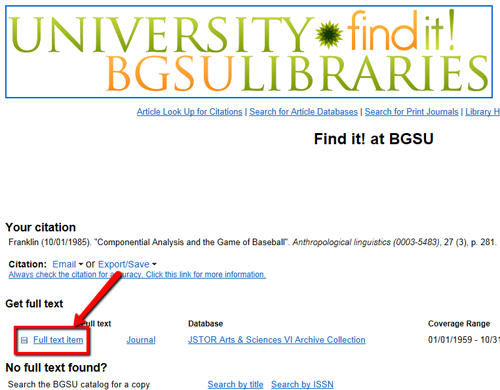 A search in the new Springer will search all the content on the site by default, but once you are looking at results you can remove ones that BGSU does not have access to and further refine your search by content type (article, book chapter, etc.) and discipline (chemistry, life sciences, medicine, etc.). Alternately, you can begin your research by browsing publications in these disciplines, or by browsing titles of each type. Important note: personal accounts on the current SpringerLink platform will NOT migrate to the new platform. Therefore, after November 26, any saved searches, journal alerts, or folders you have created in the current SpringerLink platform will be lost. Users can sign up now for personal accounts on the new platform and migrate their saved information. If you have any questions about our Springer subscriptions or this migration, please Ask Us! Elsevier journals and databases are expected to be unavailable for 19 hours this weekend, from 7:30am on Saturday, August 25, to 2:30am on Sunday, August 26, as the vendor implements new releases of its software. Affected resources are Scopus, a database for searching cited references, and ScienceDirect, a portal to thousands of Elsevier e-journals. Most journals available through ScienceDirect to BGSU users are also available full-text in the OhioLINK EJC. We always suggest our users choose Firefox, Safari or Chrome as their browser when using library resources online, because Internet Explorer often causes problems that don’t occur in other browsers. Here is the latest IE/library problem, and what to do about it. Simply click on the “Find it! at BGSU” link above the error, and then click on the link to full text on the following screen. To avoid seeing this problem, using a browser other than Internet Explorer. We have reported this problem, and developers are working on a solution. Due to scheduled vendor maintenance, the following ProQuest databases will be unavailable from 10:00pm on Saturday, June 30, to 10:00am on Sunday, July 1. Hopefully you were able to participate in our trials of PsycINFO on the EBSCO, ProQuest and PsycNET platforms earlier this summer. OhioLINK has chosen EBSCO as the platform for this important psychology database, so BGSU’s access to PsycINFO is moving to EBSCO immediately. If you have any saved searches on the PsycNET platform, please capture them soon – our access via PsycNET expires June 30, and could be cut off any time after that date. The EBSCO platform offers the same historical depth of content (1872 to the present), high-level indexing and abstracting, and wide coverage of important international books and journals in the field, with the advantage of easier full-text integration and the familiar EBSCO platform for searching, exporting records, and saving search alerts. If you have any questions about this platform migration, please contact Vera Lux, Reference & Instruction Librarian & liaison to the Psychology Department, or Amy Fry, the library’s Electronic Resources Coordinator. An interruption in electrical power on Saturday evening resulted in the UL homepage going down. ITS is working hard to resolve the issue, but it’s possible that it will be unavailable through Monday. The good news is that most of our resources (including the catalog & databases) are still available. As an emergency stop-gap, we’ve created a LibGuide that provides links to much of the content available from the UL home page. It’s available at http://libguides.bgsu.edu/home. For more information, please contact the Research & Information Desk at 419-372-6943. Have you gotten an e mail from RefWorks that looks like this? We have changed your RefWorks login name to match the email address on your account. RefWorks is making changes to accounts with duplicate usernames. If there were two accounts in the RefWorks system with the same username and one was inactive (hadn’t been used since October 2011), RefWorks changed the username of the inactive account. Therefore, if you received an e mail like the one quoted above, but are an active RefWorks user, your login for the account you usually use has not changed. If you are having trouble logging in to RefWorks, click on “Forgot Your Login Information?” on the RefWorks login page, and enter your e mail address. Any login information associated with your e mail address will be sent to that address. If you have further questions, please contact Amy Fry or Linda Rich.